Dice pineapple. Transfer to a large bowl with sugar. Let sugar and pineapple sit for approx. 15 min. Add the rum, cognac, Cointreau, and lemon juice to the bowl. Add ice and let stand for approx. 5 min., then stir. 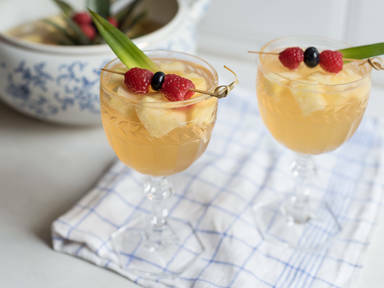 Serve in stemmed glasses, top with Champagne, and garnish with berries and pineapple leaves. Enjoy!